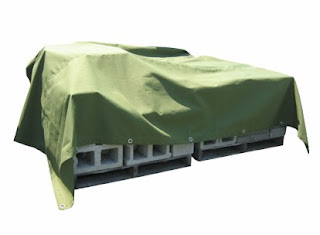 When you need a strong durable material to protect goods and construction sites, choosing tan canvas tarps is often the most reasonable choice. Many people in construction, transportation and other fields use the tarpaulins for a variety of reasons. Part of the reason for its continued popularity is that the tarpaulin is specially constructed to be durable and withstand the elements. It is made from pure cotton and filled with duck down; it also has four-ply reinforced corners. In addition, there are heavy-gauge brass grommets every two feet along the outer edges for securing loads. The colors available are white, tan, blue and green. You can choose tarpaulins that have been specially treated to ensure that they are fireproof, mildew and rot resistant and, most importantly, do not attract water condensation. To pass the strict OHSA tests, tarpaulins are hand sewn in an American factory, meaning that each order takes between seven and ten working days to complete. Many people use the tarpaulins to protect items that will be outside and subject to the elements. What sets these apart from ordinary 10-oz tarpaulins is the heavy duty weight of between 12 oz and 14 oz. The tan canvas tarps are made individually and each is finished with a thick thread shaft that extends into heavy duty edges. This ensures a tough, high quality material that does not tear easily. Such tarpaulins can be custom manufactured in any shape or color. Canvas drop cloths are prized for their heavy absorption, which is why they are preferred by painters. Due to the 10-oz strong thread, they are considered a heavy duty material. The four layers that are stitched together and reinforced at the hem give it a long lifespan compared to regular canvases. So, tan canvas tarps are useful in a range of situations around the home and at work.